Neck pain is very common. We all get it from time to time. Stress, unaccustomed postures, doing too much, injuries, falls, all can contribute. One way to help in the fight against these problems is exercise. General exercise, in the gym or on the road, is good. But there are also some more specific exercises that may help. Doing range of motion exercises every day can remind your neck of what it’s supposed to be able to do. All the muscles are worked and stretched, making them more able to respond to sudden demands when you want to do something. First, we need to talk a bit about relaxation. If we are anxious, tense or unrelaxed, this has important effects on our body systems and one of them is our pain sensitivity. This can interfere with our ability to use our joints naturally. Checking in the mirror, or having someone watch you, can be useful as we often can’t see what we’re doing. Relaxation looks simple but is hard to do well, and it needs practice to become skilled so you can use it under stress. However, it can help your pain and activities as well as your mood. The daily practice typically refers to meditation, exercise, eating well, work etc but here it just means doing the exercises regularly. The results you get from just keeping going, doing the exercises and relaxation over time, is much greater than we realise. If you make sure your neck gets put through all the movements it’s capable of doing every day, this reminds it of what’s normal. You can increase the movement, keep your strength up and reduce pain. The exercises are very simple and not a magic solution to anything. If you keep them up over the days and weeks you will begin to see progress as your neck becomes less painful and more mobile. If you have chronic (long-term) neck pain you may find that the exercises can maintain your movement but don’t change the pain much. Start low by doing one set of five movements and do them slowly and in a relaxed and easy a fashion as you can. As you become more confident and your knee does not react, you can increase the numbers of sets, the numbers of movements and the times you do them every day. Three times a day, three sets of ten movements would be a good aim with time. This movement is called cervical flexion or neck flexion by physiotherapists. Allow your head to come forward so that your chin touches your chest or nearly does so. You will be looking right down at the floor or your lap if you are sitting. Do slowly five times, coming up to looking straight forward each time. This movement makes all the muscles at the back of the neck, which are often tight and tense, stretch out. Keep these muscles and ligaments long and relaxed can really help tension neck pain problems. Slightly more difficult is to add a small chin tucking movement (called cervical retraction – see below) before doing the flexion. It adds to the stretch feeling and can be done once you have done the easier version for a while. This is known as cervical extension. 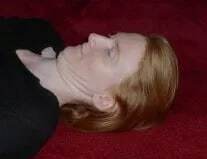 NB If you have dizziness problems with neck movements, or feel dizzy while you are doing this, leave this movement out. It can indicate that you are compressing blood vessels in your neck as you do the movement and is best avoided. Move your head back until your face is looking up at the ceiling. Don’t do this movement quickly or forcefully as this can result in discomfort or pain. As you go through the movements you can let your neck ease back a little further at the end of the movement, and then leave it there for a few seconds provided that you feel ok. It may be more effective if you concentrate on going to one side and back to the middle each time rather than go from right to left and then to right etc. Turn your head to one side until it can’t go any further. Hold that position for two or three seconds and then return to the centre each time. Once you have done the number of times to that side, have a short rest and then do the other side. 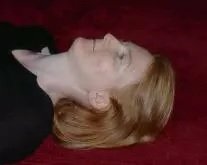 NB Again: If you have dizziness problems with neck movements, or feel dizzy while you are doing this, leave this movement out. It can indicate that you are compressing blood vessels in your neck as you do the movement and is best avoided. This is a harder movement to perform and tends to feel a little strange and tight at first. Keep your face straight on to the front and tip your ear down to the same side shoulder. Don’t push hard with this one, just allow the movement to take place. Moving from one side to the other in the same movement can be aggravating. Known as cervical retraction, this is the most difficult to learn if you just can’t do it naturally straight away. It allows us to counter the tendency to have our heads stuck forward all the time – the “poking chin”. The poking chin posture keeps our lower neck bent (flexed) and our upper neck arched (extended), which can contribute over time to neck pain and headaches. The end point is when your face is pulled back as far as you can, a bit like a sergeant major on parade, while you keep your face front on with tipping it in any direction. It looks funny and strange if you get the movement right so probably best to do this one in private. Hold the backwards end of the movement for a few seconds. This movement stretches the upper few vertebrae of the neck, counteracting the tendency for long periods in the poking chin position. It can help with headaches of neck origin. To start, lie down on your back on a firm surface. The bed will do if you can’t get on the floor and you can use a pillow if you don’t like to be completely flat. Think of your head as a bowling ball which you rotate frontwards and backwards, doing a nodding motion. Don’t lift your head up at all and you should feel it is a bit stretchy in the back of your neck just below the skull. Don’t push this exercise hard as it is quite a stretch in some people. Once you have the idea in lying you can progress to doing the movement in sitting or standing up. It’s a small movement so there shouldn’t be much head movement.